The tournament will take place at the J.S Blatter Football Complex in Apia, where the Cook Islands will battle against teams from Tonga, American Samoa and host nation Samoa for the sole berth remaining at the 2017 OFC U-17 Championship in Tahiti. As they make their way for Samoa, national coach Richard Anderson was enthusiastic about his team and commended their commitment over the last few months in preparation for the tournament. “The boys have been working very hard and I can’t fault them in their dedication and time spent at training sessions,” he said. The 18-man national side consists of a domestic-based majority, with an additional player to join the team in Auckland. “This is very encouraging for the Cook Islands and I think for the long-term development of football in the country the more domestic-based players that we can get at the good enough standard to play this could well be the foundation for them to achieve success and be a driving force at future tournaments,” said Anderson. The Cook Islands will face a tough start to the tournament in Samoa as they take on Tonga, who has been traditionally a very physical side to overcome. The Cook Islands team will arrive in Samoa on Tuesday and take the pitch for their first match against Tonga on Friday 1 July at 5:30pm Cook Islands time. 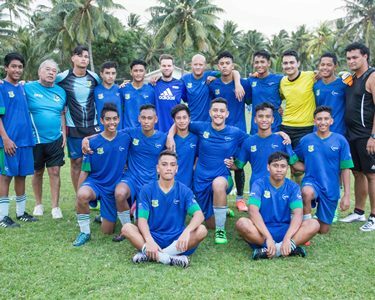 You can follow the U-17 team’s journey at the OFC U-17 Championship Preliminary tournament via the Cook Islands Football Association’s Facebook Page, and live updates of the matches will be posted on Twitter @OFCfootball.